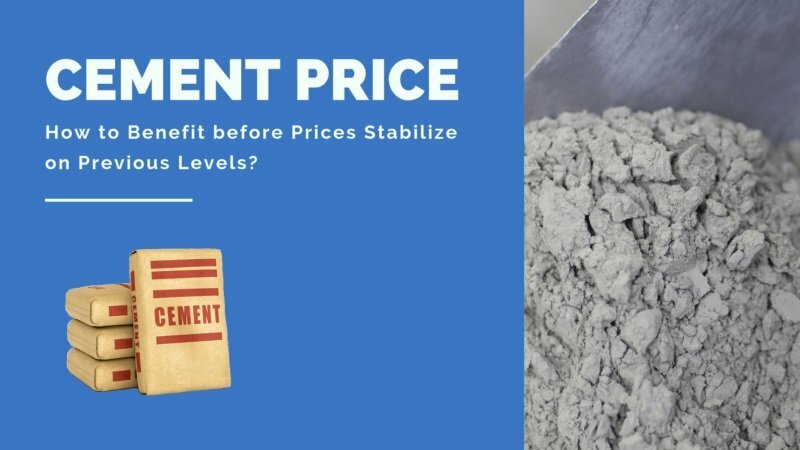 Cement Prices in India: How to Benefit before Prices Stabilize on Previous Levels? Cement prices have been on a rise for the past few months. According to analysts and industry experts, the predatory and aggressive strategies of cement companies to boost sales was the main reason for low cement prices in India in recent times. If we talk about the latest cement price, it has seen an increase of about six percent in the last month. Compared to January, today’s cement price stands at INR 310-315, a spike of INR 15-20 per bag. The dynamic marketing strategy and changing approach of cement manufacturers all over the country has led to a progressive rise in the prices of cement across all the regions. While checking top brand cement prices in India, one can easily see how the prices have been rising gradually in the last one year. What should one do in such a scenario? Is the situation temporary or one should start adjusting his expenditures according to these inflated prices? Well, in this blog, we share some insights on how to take advantage of the situation without making an infrastructure project suffer. What to Do in a Dynamic Market Characterized by Rising Prices? For builders, contractors, project promoters as well as individuals, the increase in cement prices in India has come as an obstacle. As most of the projects have stringent budgetary constraints, an increase in price of an essential material such as cement has the potential to affect the dreams of millions. For a project promoter and even a contractor, stopping work on a project due to an increase in prices isn’t a feasible option. But one can surely plan the course of action, in advance to avoid last-minute purchases at inflated prices. When talking about cement prices one can keep an eye on prices for top brands such as Ultratech Cement Price, Ambuja cement price, among others, and plan the project accordingly. If the basic structure of a project is completed, one can focus on other aspects that don’t require cement at the moment. Also, one can think of planning ahead and build a reserve stock that can be used in case when prices are higher. Cement prices dwindle on a daily basis owing to a variety of reasons. So, one should always keep an eye on latest cement price as well as other economic indicators & market trends. This way, one can predict movements and variations, well in advance and plan for purchasing cement, accordingly. One can check online cement prices, daily and rest assured of not missing any precursor or indicator that can promise purchase at a lower rate. It goes without saying that one should engage in bulk buying for materials such as cement. It is a known story that cement manufacturers were resorting to providing deeper discounts for an extended period that kept the prices down in the previous years. As a builder or a promoter, one can buy cement in bulk and get advantage of discounted cement price. This way one can keep the project moving without impacting the bottom line. No one can deny that if one intends to get best quotes, one need to contact authorized distributors and suppliers, only. While it is good to scrounge the market for better prices, one should always resort to purchasing cement from authorized and genuine suppliers. This way one is assured about the quality while at the same time, best prices. Many times, it has been seen that speculation and hoarding have a role to play in hikes at regional levels. By staying in touch with authorized suppliers one gets the latest information about top brand cement prices in India and get the best deals. So, now you know what to do when cement prices rise and how to take benefit of the situation, stay focused on infrastructure development with increased peace of mind. At the same time, keep an eye on any major development that has the potential to trigger any downtrend and plan your cement purchases, accordingly.